Last September, J.Crew assembled a cast of characters for its New York Fashion Week showcase who were "real people," meaning people who were not professional models. Fittingly, the cast was made up of people of various ages, sizes, shapes, races and yes, even heights. In an era of ceaseless and unabashed body positivity, women of different shapes, ages, shades and sizes at a NYFW show wasn't all that surprising. But this height thing, with models of very small stature, definitely was. Entrepreneur Audrey Gelman, for instance, who appeared in this show, is 5'1". Before that moment, truly short women were nearly invisible in fashion. There were the "shorter models" like Kate Moss who, sure, at 5'6", would fit the definition. But no one was out there at fashion weeks standing 5'4" or shorter, a height that would deem someone "petite." In 2009, Tyra Banks actually created an entire America's Next Top Model season dedicated to models 5'7" or shorter to try to even out the playing field, and the winner ended up being Nicole Fox, who's 5'7". Given that the average American woman is 5'4", that's not that short. But over the past few months, more and more models who are Kate Moss' height and shorter have started breaking into the industry. There's Amina Blue, who's walked for Kanye West's Yeezy every single season, who stands at 5'1". 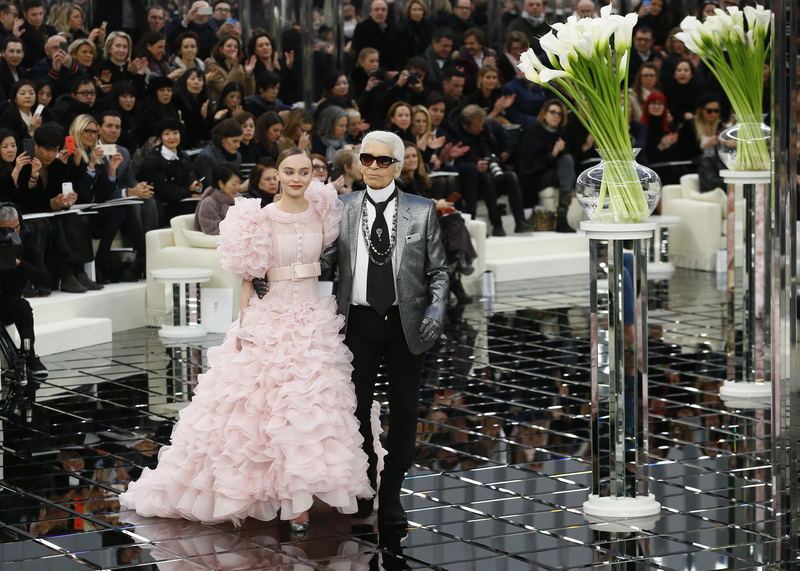 There's Lily-Rose Depp, who's walked for Chanel, who's 5'3". There's Tess Holliday, who recently made her NYFW runway debut at an Ashley Nell Tipton show, who's also 5'3". On the merely short-for-a-model end, there's Sofia Richie and Lottie Moss, both of whom have walked for Chanel and are 5'6". Why is this happening now? Well, apparently the fault is all ours, as in the people who look to Instagram and influencers to feel inspired. "Instagram has had a radical impact of what people want to see," famed casting director James Scully said in an interview. "I would say that there is no definitive kind of model these days. Even the Gigi [Hadid]s and Kendall [Jenner]s have come out of Instagram. This generation of people is about wanting to be seen, and if they're not seeing themselves, then they'll find it or make it happen. These influencers represent something more real and identifiable than a model or a celebrity. The idea of beauty is changing, and there's so much access to so much." In other words, people are pushing for a more relatable kind of beauty. Shorter models are an extension of that, which Scully isn't so jazzed about. "The big barrier that's been broken down with fashion is that real people have now taken over," Scully said. "Because there are no gatekeepers. Fashion's not meant to be egalitarian, though. If there's nothing to aspire to, then what's the point of having it? People want experiences. Fashion was never meant to have this kind of all-over-the-world-ness." But that's exactly what some people want from fashion right now: to see models who look, maybe just slightly, like them. Given that the average American woman is 5'4" then, well, you do the math. At this point, are designers and brands embracing these models because of their height, and because they want to attract those people who want more realistic images of women? That's up for debate. "I think when it comes to shorter models, a lot of them seem to be celebrities or Instagirls, especially in the case of Lily-Rose Depp, Sophia Richie, Lottie Moss," Jennifer Davidson, editor in chief of the Fashion Spot, a fashion website that regularly calculates diversity reports for the fashion industry, said. "All of them had name recognition before they broke onto the industry. I think having a big social media presence definitely helps. I think brands see that if they already have a fanbase on Instagram, it's a low-risk hire." In a lot of cases, designers and brands aren't consciously choosing these models because of their height. There's usually other factors, two major ones being fame and internet popularity. Depp, the daughter of Johnny Depp, has 3.2 million Instagram followers. Richie, the daughter of Lionel Richie, has 2.7 million Instagram followers. Blue has more than 600,000 Instagram followers. Moss, Kate Moss' sister, has 165,000 followers. In that sense, counting shorter models breaking into the fashion industry as part of the body-positivity movement is complicated. "I do think it's a sign of body positivity," Scully said. "People want to look at images of someone they can relate to, and that's great. With blogs and Instagram, it's normalizing fashion, and so these people resonate in a way that magazines can't anymore. But at the same time, I think that [designers] are totally not thinking about height. They're thinking about the girls, and the people who are going to love them once they cast these people in their campaigns." Nala Wayans, daughter of Marlon Wayans, walks in the Sherri Hill Spring 2018 show. Corinne Foxx, daughter of Jamie Foxx, walks in the Sherri Hill Spring 2018 show. Ciel Taylor, daughter of Niki Taylor, walks in the Sherri Hill Spring 2018 show. Barron Hilton, son of Kathy and Conrad Hilton, (C) walks in the Hakan Akkaya Spring 2018 show. Amelia Gray Hamlin, daughter of Lisa Rinna and Harry Hamlin, walks in the Dennis Basso Spring 2018 show. Mingus Reedus, son of Norman Reedus and Helena Christensen, walks in the Calvin Klein Spring 2018 show. Kaia Gerber, daughter of Rande Gerber and Cindy Crawford, walks in the Coach Spring 2018 show. Kaia Gerber, daughter of Rande Gerber and Cindy Crawford, walks in the Fenty x Puma Spring 2018 show. Kaia Gerber, daughter of Rande Gerber and Cindy Crawford, walks in the Alexander Wang Spring 2018 show. Kaia Gerber, daughter of Rande Gerber and Cindy Crawford, walks in the Calvin Klein Spring 2018 show. Mason Grammer, daughter of Kelsey and Caimlle Grammer, walks in the Malan Breton Spring 2018 show. Gigi Hadid, daughter of Mohamed and Yolanda Hadid, walks in the Anna Sui Spring 2018 show. Gigi Hadid, daughter of Mohamed and Yolanda Hadid, walks in the Prabal Gurung Spring 2018 show. Bella Hadid, daughter of Mohamed and Yolanda Hadid, walks in the Michael Kors Spring 2018 show. Bella Hadid, daughter of Mohamed and Yolanda Hadid, walks in the Anna Sui Spring 2018 show. Bella Hadid, daughter of Mohamed and Yolanda Hadid, walks in the Prabal Gurung Spring 2018 show. Kendall Jenner, daughter of Kris and Caitlyn Jenner, walks in the Michael Kors Spring 2018 show. Kendall Jenner, daughter of Kris and Caitlyn Jenner, walks in the Alexander Wang Spring 2018 show. Catherine Zeta-Jones and her lookalike daughter Carys at the Michael Kors Spring 2018 show. Vanessa Williams and daughter Jillian Hervey at the Christian Siriano Spring 2018 show. It's important to note too that no matter who is "breaking barriers" in casting shorter women, the fashion industry is still gravitating toward conventionally attractive short women. They are, first and foremost, thin and famous and privileged and therefore able to flaunt a certain lifestyle on social media, attracting a throng of fans and popularity powerful enough to book them a job. Holliday is the outlier in this yet again, because she is plus size, and even still with an army of fans on social media (1.5 million on Instagram), she remains locked out of many mainstream fashion shows and campaigns. Her most regular partners are inclusive retailers like Torrid, Penningtons and ModCloth and the only NYFW show she's walked in was a plus-size fashion show from plus-size designer Ashley Nell Tipton last September. So it's not like the fashion industry is rapidly changing here. But however slow the industry is, shorter women are undoubtedly excited about the idea of seeing women their height being muses in the fashion realm. They see it as a step in the right direction for a future where they will be thought of as valuable consumers who just happen to be short. "This change has come from women reviewing and speaking up about the different images a brand puts out there," Avani Agarwal, a co-founder of Stature, an online retailer specializing in petite clothing, said. "Beauty is so changed now. I am a woman of color and grew up with little representation. As we begin to have a broader definition of what is normal and beautiful, I think that's going to change the fashion industry for the better."